There is a number of accommodation options at Greenmans on the Hawkesbury, all are about keeping it simple and focus on making the most of the facilities on site and in the local area. Take a step back in time and enjoy our back-to-basic waterfront caravans. 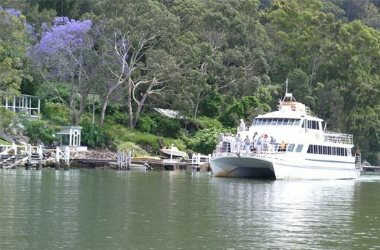 Set on the banks of the beautiful Hawkesbury River. Ideal for enjoying an open camp fire with more than just a few more features than a tent; they all feature kitchens with cutlery, crockery and cookware and gas bbq facilities. We provide you with light doonas and pillows, you need to bring you own sheets and towels (sheets are available at a small cost). All your amenities (toilets, showers and laundry) are only a hop, skip and jump away. Greenmans on the Hawkesbury has a generous camping site with both powered and non-powered sites. Several prime sites are absolute waterfront with views of the Hawkesbury through mangroves. The campsites have ready access to a range of amenities including ablution blocks, a laundry, campfires and a large undercover camp kitchen with food preparation area, BBQs and a communal dining area.